Are you looking for a christening present original? A little girl who is baptized, a beautiful symbolic moment. Are you the proud godfather, godmother or grandparents of the baptized and want therefore to give a symbolic christening gift? Then a baptism ornament with glittering cross the perfect christening gift for you. 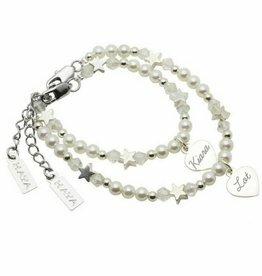 Specially designed for this special milestone KAYA christening bracelets, each one (extra strong) made of the finest materials such as genuine freshwater pearls, gemstones and glittering crystals. 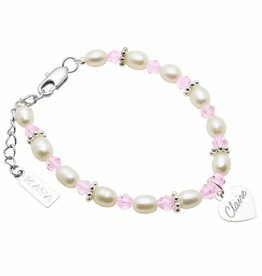 With the charm 'baptism in 2015 or her first name you care for a precious keepsake which she will cherish forever. This must be the most beautiful christening gift of baptism! A baptism gem is a nice present for her baptism she can on the big day. You can even personalize the baby bracelet with a charm baptism in 2016 to hang (€ 3.95 extra). 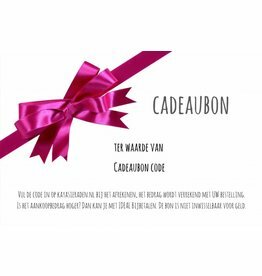 Each baptismal jewelery comes in a silk sieradenbuideltje, so it is equally ready to give. Then this is a beautiful silk bag bewaarbuideltje for her baptism gem, a special memory of her big day. Who knows, this christening bracelet like the christening gown also passed to the next generation. "Keeping the memory alive", this is where Tanja Rakhou (founder) in mind when she designed Mom matching bracelets with baby christening bracelets. Baptism is for mommy perhaps even more special than her little girl how symbolic; Mom and baby the same piece of jewelry as a sign of their commitment! Browse through our collection of christening gifts, there's something for you to determine. This bracelet is specially designed for baptism or communion of a boy. Made of black onyx beads with shimmering cross. With this gift you can certainly arrive at the beautiful day and a tangible reminder for later. This bracelet is designed specifically for the baptism or communion of a boy. Made of black onyx beads with genuine .925 silver parts. With this gift you can certainly arrive at the beautiful day and a tangible reminder for later. Glistening white Swarovski crystals change the white pearls set in beautiful pearl bracelet with matching rosary. The rosary is tailored for children (60 cm), suitable for baptism or communion. This extra luxury bracelets are true ceremonial pieces: Glistening handmade ivory pearls change the pink Swarovski crystals and sweet rings off. On the bracelet hangs a ball center, symbolic of love. 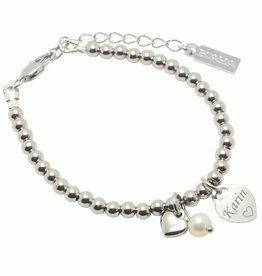 A truly personal gift, engrave choice of a name, word or date on this silver bracelet mum. Wonderful cool bracelet of sterling silver, beautiful in its simplicity. Made of shimmering silver balls in the 'Tiffany style. Infinity bracelet in sterling silver, engrave her name or special words! Personal and symbolic sweet gift for any woman.